Style and simplicity is the hallmarks of this classic bedframe. Features a subtle camelback profile headboard gives it an understated, elegant line, while the shapely contour on both headboard and footboard give the bed a hint of elegance. It's expertly made with selected solid woods with a substantial presence for comfort and lasting quality. Two bed sizes available: Twin and Full. 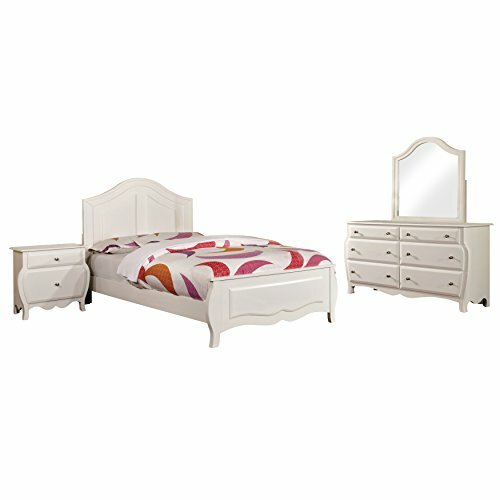 This set includes one Full-size bed, one nightstand, one dresser and one mirror. Assembly Required. Manufactured in Vietnam, assembly required. Bed measures 79.75 inches wide by 59.75 inches deep by 52 inches high; Nightstand measures 24.88 inches wide by 15 inches deep by 25 inches high; Dresser measures 52.75 inches wide by 17 inches deep by 32 inches high; Mirror measures 30 inches wide by 1 inch deep by 37 inches high. Pictures are for illustration purposes. All décor items are not included in this offer.